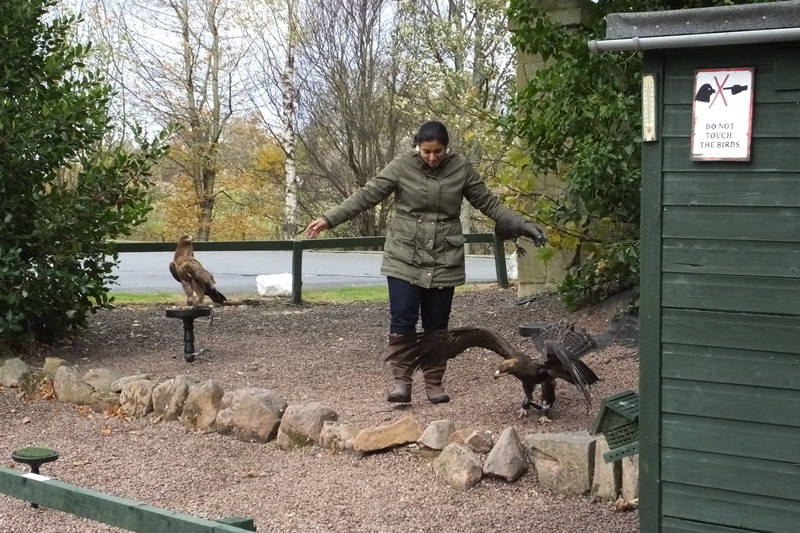 Scotland is falconry crazy. What used to be the sport of kings is now the sport of anybody who can get over there and spend $60 or so on a bird thrill. So, still spendy, but regular people can do it. And we did. 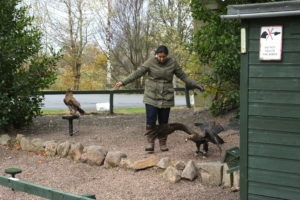 My flew into Edinburgh, Scotland, a few weeks ago and immediately took a cab to Dalhousie Castle and their falconry program. For a 9-day trip this was the one activity I went to the trouble of arranging beforehand. It was the thing my daughter was most excited about before and after the trip. And it was totally worth it. 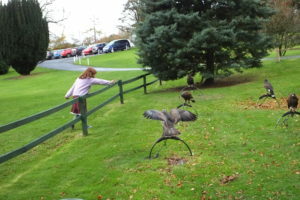 Falconry Scotland offers you a chance to handle falcons, eagles, hawks and–get this–owls land on your gloved hand. We ended up showing up early, had coffee in the castle then came out to see the two falconers getting 37 birds out of their cages and boxes for the day. What was most delightful was how well the women knew each of the birds. Some birds wanted a cuddle, some keep-away from the keepers. 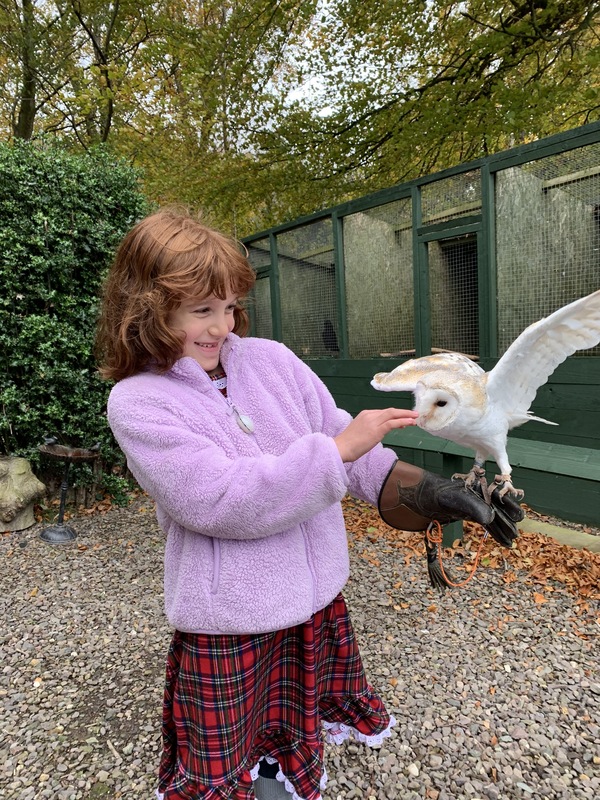 My daughter Ginger, 7, was particularly fascinated with a talkative barn owl. I mean, this bird chatted non-stop. I asked one of the falconers, Allie, if the bird was just hungry or what. No, she explained, that owl, named Jeanne, just likes being with people. Eventually four of us went out in the field to do falconry. Again, the most amazing thing about this place is how much our falconer Allie knew of each bird and the back-and-forth she had with them. Allie explained the tail-swishing meant the bird was ready for flight. The Harris Hawk would easily–ever so delicately–land on each person’s gloved hand to eat the meat held between the fingers. Except when it came to Ginger. For Ginger the bird swooped around, every once in a while trying to steal the meat. Ginger laughed but held steady. We gave up on Ginger doing falconry with that particular bird, who is sometimes afraid of children. Instead, Ginger got a fabulous consolation prize: she got to hold and feed the friendly owl Jeanne. I cautioned Ginger to keep her fingers away from Jeanne’s mouth, but Allie corrected me. This is a gentle bird and would only nibble affectionately. Which she did. Other places nearby like Elite Falconry actually go hunting. (They are mainly targeting game birds because rabbits are in trouble. 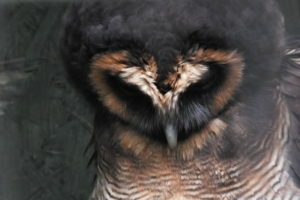 Also, Elite Falconry breeds owls.) 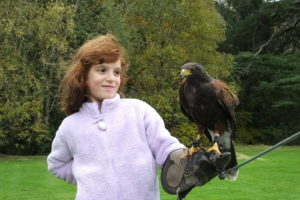 And there are even a few places in the U.S. where people can go do falconry (also usually at luxury hotels). But to get to become a falconer in the U.S., you have to go through many levels of training, permits and nonsense. So it is going to be a much stricter atmosphere. If you want to befriend an owl, best go to Scotland.